Richard Holmes is Professor of Biographical Studies at the University of East Anglia, and editor of the Harper Perennial series Classic Biographies launched in 2004. He is a Fellow of the British Academy, has honorary doctorates from UEA and the Tavistock Institute, and was awarded an OBE in 1992. His books have won the Somerset Maugham Prize, the Whitbread Book of the Year, the James Tait Black Prize, the Duff Cooper Prize and the Heinemann Award. 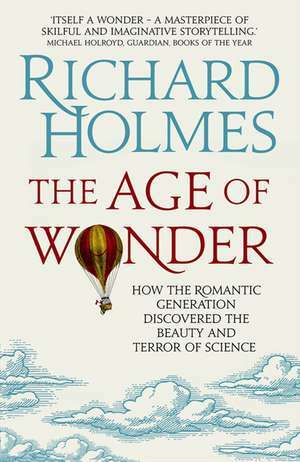 His most recent book, The Age of Wonder, won the Royal Society Prize for Science Books and was shortlisted for the Samuel Johnson Prize. Banks was twenty-six years old, tall and well-built, with an appealing bramble of dark curls. By temperament he was cheerful, confident and adventurous: a true child of the Enlightenment. Yet he had thoughtful eyes and, at moments, a certain brooding intensity: a premonition of a quite different sensibility, the dreaming inwardness of Romanticism. He did not like to give way to it. So he kept good company with his shipmates, and had carefully maintained his physical fitness throughout the first eight months of the voyage. He regarded himself – ‘thank god’ – as in as good mental and physical trim as a man could be. When occasionally depressed, he did vigorous jumping ‘rope exercises’ in his cabin, once nearly breaking his leg while skipping. He was capable of working patiently for hours on end in the extremely cramped conditions on board. The quarterdeck cabin, which he shared with his friend Dr Daniel Solander, was approximately eight feet by ten. He had adopted a strict daily routine of botanical drawing, electrical experiments, animal dissections, deck-walking, bird-shooting (when available) and journal-writing. He constantly fished specimens from the sea, shot or netted wild birds, and observed meteorological phenomena, such as the beautiful ‘lunar rainbows’. When his gums had begun bleeding ominously with the onset of scurvy, he had calmly treated himself with a specially pre-prepared syrup (‘Dr Hume’s mixture’) of concentrated lemon juice, taking precisely six ounces a day. Within a week he was cured. Just occasionally young Banks’s scientific enthusiasm turned to explosive impatience. When rudely prevented from carrying out any botanical field trips by the Spanish Consul at Rio de Janeiro, and confined for three weeks to the sweltering ship in the harbour at Rio, he wrote colourfully to a friend at the Royal Society: ‘You have heard of Tantalus in hell, you have heard of the French man laying swaddled in linen between two of his Mistresses both naked using every possible means to excite desire. But you have never heard of a tantalized wretch who has born his situation with less patience than I have done mine. I have cursed, swore, raved, stamped.’ Banks did however unofficially slip over the side at night to collect wild seeds and plants, a hoard which included the exotic purple bougainvillea. As the men walked back, feeling dangerously like royalty, the Tahitian girls draped them with flowers, offered ‘all kind of civilities’ and gestured invitingly towards the coconut mats spread in the shade. Banks felt, reluctantly, that since islanders’ houses were ‘entirely without walls’ it was not quite the moment to ‘put their politeness to every test’. He would not have failed to have done so ‘had circumstances been more favourable’. Tahiti lies roughly east–west just below the 17th parallel, one of the largest of what are now the Society Islands, roughly halfway between Peru and Australia. It is shaped not unlike a figure of eight, some 120 miles (‘40 leagues’) in circumference. Most of its foreshores are easily accessible, a series of broad, curving bays with black volcanic sands or pinkish-white coral beaches, fringed by coconut palms and breadfruit trees. But a few hundred yards inland, the ground rises sharply into an entirely different topography. The steep, densely wooded volcanic hills lead upwards to a remote and hostile landscape of deep gullies, sheer cliffs and perilous ledges. Contrary to legend, the Endeavour, commanded by Lieutenant James Cook, was not the first European ship to make landfall in Tahiti. Spanish expeditions, under Quiroz or Torres, had probably touched there in the late sixteenth century, and claimed it for Spain. A previous English expedition, under Captain Wallis of the Dolphin, had definitely landed there in 1767, when it was described as ‘romantic’, and claimed for England. A French expedition under Louis-Antoine de Bougainville had anchored there the following year, and claimed it for France. The French had racily christened Tahiti ‘La Nouvelle Cythère’, the New Island of Love. Banks’s opposite number, the French botanist Philibert Commerson (who named the bougainvillea after his captain), had published a sensational letter in the Mercure de France describing Tahiti as a sexual ‘Utopia’. It proved that Jean-Jacques Rousseau was right about the existence of the Noble Savage. But then, the French had only spent nine days on the island. Cook was more sceptical, and had every member of his crew (including the officers) examined for venereal infections four weeks before arriving, by their surgeon Jonathan Monkhouse. He issued a series of Landing Instructions, which stated that the first rule of conduct ashore was civilised behaviour: ‘To Endeavour by every fair means to cultivate a Friendship with the Natives and to treat them with all Imaginable Humanity.’ It was no coincidence that he enshrined the ship’s own name in this instruction. Joseph Banks had his own views on Paradise. He gave a whimsical account of his first night ashore in his Endeavour Journal. He dined deliciously on dressed fish and breadfruit, next to a Tahitian queen, who ‘did me the honour with very little invitation to squat down on the mats close by me’. However, the queen was ‘ugly enough in conscience’. Banks then noticed a very pretty girl, ‘with a fire in her eyes’ and white hibiscus in her hair, lingering in the ‘common crowd’ at the door. He encouraged her to come and sit on his other side, studiously ignored the queen for the rest of the evening, and ‘loaded’ the Polynesian beauty with bead necklaces and every compliment he could manage. ‘How this would have ended is hard to say,’ he observed later. In fact the amorous party broke up abruptly when it was discovered that his friend Solander had had a snuffbox picked from his pocket, and a fellow officer had lost ‘a pair of opera glasses’. It is not explained why he had brought opera glasses ashore in the first place. This thieving proved to be completely customary in Tahiti, and led to many painful misunderstandings on both sides. The first occurred the following day, when a Tahitian quite openly made off with a marine’s musket, and was immediately shot dead by a punctilious guard. Banks quickly grasped that some quite different notion of property must be involved, and noted grimly: ‘We retird to the ship not well pleasd with the days expedition, guilty no doubt in some measure of the death of a man who the most severe laws of equity would not have condemnd to so severe a punishment. No canoes about the ship this morning, indeed we could not expect any as it is probable that the news of our behaviour yesterday was now known every where, a circumstance which will doubtless not increase the confidence of our friends the Indians.’ Nonetheless, to Banks’s relief and evident surprise, good relations were restored within twenty-four hours. The Endeavour expedition remained for three months on Tahiti. Its main object was to observe a Transit of Venus across the face of the sun. (Cook stated that this was the reason their settlement was named Fort Venus, though his junior officers gave a different explanation.) This was due on the morning of 3 June 1769, and there would be no other transit for the next hundred years (not until 1874). It was a unique chance to establish the solar parallax, and hence the distance of the sun from the earth. This calculation depended on observing the exact timing at which the silhouette of Venus first entered, and then exited from, the sun’s disc. Banks decided to send back the midshipman with a brief message to Cook that armed reinforcements would be welcome. Meanwhile he and Green would press on alone, ‘telling him at the same time that it was impossible we could return till dark night’.